Government of Karnataka, Department of Rural Development and Panchayath Raj (RDPR) has been initiated the process of recruitment of Panchayath Development Officers (PDO) and Grama Panchayath Secretary (Grade-1) posts. The Panchayath Raj Department of Karnataka has chosen Karnataka Examination Authority (KEA) for conducting the examinations and instructed the prescribed examination fee in favor of the Government. This recruitment process carries about 815 Panchayath Development Officers (PDO) and 809 Grama Panchayath Secretary (Grade-1) positions including the reserved vacancies for Hyderabad-Karnataka region. The official notification for PDO Recruitment will be announces soon. The notification includes the age limits, educational qualification, exact dates for submission of applications and payment of fees, etc. We at CoastalHut have tried to provide the syllabus and model question papers for PDO Examinations. The below attachments help the job seekers to prepare for the PDO Jobs. Please Note: The information provided above are not final. They might vary with the official notification issued by RDPR or KEA in near future. We strongly suggest you to refer the official notification, once it is available. Wen online registration will start?? I am interested to apply for this job. But I am not able to register or make online payment through the link. So kindly give the information that how to do online registration and payment. Applications yet to start.. Keep patience and wait till the application enabled for apply. i want to apply for grama panchayti secretary (grade |). please provide syllabus and model questions for this particular job. Please tell us wen online application will start?? ಸರ್ ಆನ್ ಲೈನ್ ಸೇವೆ ಯಾವಾಗ ಪ್ರಾರಂಭವಾಗುತ್ತದೆ ಎಂದು ನಮಗೆ ಹೇಗೆ ತಿಳಿಯುವುದು . Sir/Mam can i get detailed information about this exam?? Updated notification will come shortly. Please wait.. When is last date to apply for this exam..
Sir/mam All ticket recived and Examination date tell me. When we can expect the date of commencement of online application.. Please tell us that posting provided by you is genuine or fake. Wen Online Registration Will Start? Please give us information about PDO Examinations, and syllabus. Hi sir please give me information about the what are the documents attach for applying pdo and grade 1 post. when is PDO exams date first and second? Pls confirm us when will be online for application will start. Online application already started.. Just find the Application link above. 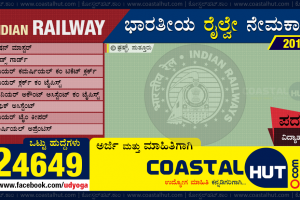 ಆನ್ಲೈನ್ ನಲ್ಲಿ apply ಮಾಡುವ link ಬೇಕಾಗಿಧೆ. Sir i have dout on pdo exam paper.Kannada vesion & english version papers are in same booklet or saparete . bez we r studing computer litrecy test in english & other syllabus in Kannada . No. You have not provided options to change the examination centre. Hope you have downloaded now! Can you please tell me when the exams will be conduct. Dear sir, I want to PDO written exam date, if you know that date please inform me. please sir many information in PDO & banking exam. I wanted to know what is the PDO exam center in BELGAUM. In my hall ticket. Only BELGAUM is printed. Please tell where is the exam center in BELGAUM. Its urgent..
No fresh notifications available at present..